In 2014, I posted a series of Birth Announcements that were taken from real hospitals across the US. After combing through all of the names and tallying them up, I came across the twenty most commonly recurring middle names for boys. Disclaimer: This is very limited data. The following featured names appeared the most often in my small collection of birth announcements which can be found on the name lists page. Of course, I would much rather have official data on that. If the Social Security Administration made a list of the most popular middle names, things would be easier and namers like me would be thrilled. Since they don't compile that data, I had to improvise. What I noticed, though, is that we tend to like our male names to be on the traditional side. It may be that many parents use the middle name spot to honor male relatives. Many may simply favor solid, classic choices above the more modern and trendy, while others pair a trendy first name with a classic middle name for balance. (31 uses) James is the English form of the Late Latin name Iacomus, which means James and Jacob are related. 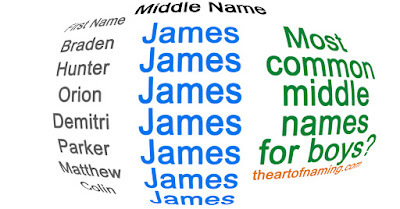 It may be safe to assume that James is the most popular middle name for boys. The data used here is admittedly limited, but James is very prevalent elsewhere too. As a first name, it ranked at # 9 in 2014. It is also the #1 male name overall for the past 100 years combined, out ranking all other male names. Girls are being named James now too. 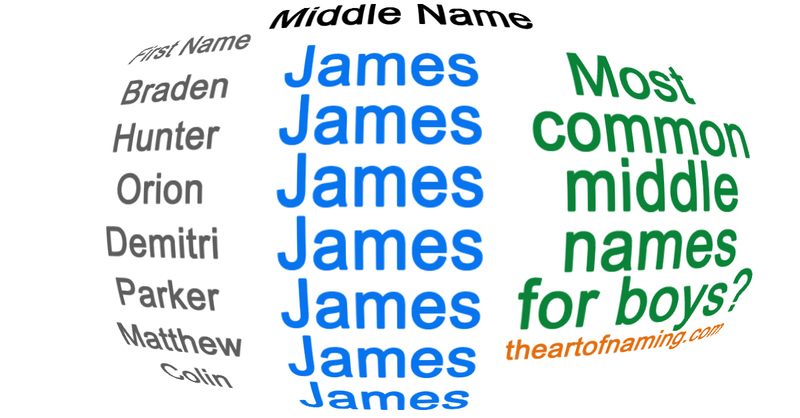 There were two girls within this data that were given James as a middle name. If you are wanting something uncommon, this is not the name for you. (15 uses) Michael comes from the Hebrew name Mikha'el meaning "who is like God?". Michael was the #1 boys' name in America from 1954 to 1998. It still ranks well today as a first name, falling only down to #7 in 2014. As a middle name, according to my small data set, Michael was the 2nd most recurring with 15 births. While Michael has always been given to boys as firsts and middles, it has also been used for girls since the early 1900s. (13 uses) This is the Latinized form of the Greek name Alexandros which means "defending men". This strong name for boys has always ranked well in the US. It's also sometimes given to girls even in lieu of the feminine forms like Alexandra. Since the late 1980s, Alexander has been massively popular. It ranked as high as #4 in 2009. 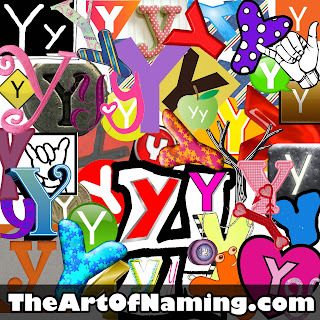 Currently it is the 8th most popular name for boys as of 2014. 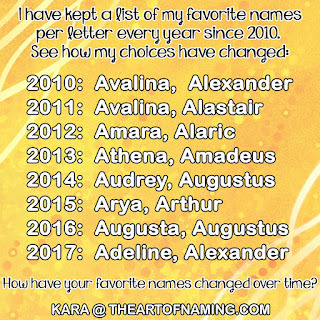 Within our small data set here, there were 13 instances of Alexander being used as a male middle name, which puts it at #3 on The Art of Naming. (13 uses) The name John is the English form of Iohannes, which comes from the Greek Ioannes which comes from the Hebrew Yochanan meaning "YAHWEH is gracious". John has always been a typical name, (think John Doe), but it is no longer the most popular overall boy name since James took that title. John was #1 from 1880-1923 and ranked in the Top 10 until 1986. Currently, John ranks at #26 in the US. (11 uses) The Hebrew name Yosef lead to the Latin and Greek Ioseph, which brought about the English Joseph as we know it. It means "He will add". There are many saints with this name, including the husband of the biblical Mary. The name Joseph was more common among Jews in the Middle Ages than with Christians. Later Joseph gained popularity in Spain and Italy then in England. This name has a ton of variations and translations across different languages around the world (things like Yosif, Josepe, Peppe, Giuseppe, José, and more). Joseph, itself, has never ranked lower than #22 in the US. It has spent decades in the Top 10. In 2014, it was #20. (11 uses) Lee comes from a surname that was derived from the Old English leah meaning "clearing". This name is predominately masculine but it has always been given to females too, which means it can be considered unisex. It ranked at its best for males in the 1940s and 1950s. It spiked for females through the 1950s and 1960s, too. Popularity has declined for both genders recently with only 348 male births (#701) and 23 female births in the US in 2014. It seems likely that Lee (and possibly the feminine equivalent Leigh) are used more often as middle names than first names now. (10 uses) The Hebrew name dawid probably comes from the Hebrew letters dwd meaning "beloved". As a name, David has been used since the Middle Ages in Britain and was huge in Wales and Scotland. It has vast international appeal and recently ranked within the Top 100 in nearly 30 different countries. In English, it's DAY-vid, but many languages opt for the dah-VEED or DAH-vit pronunciations. This name has always within the Top 35 names in the US. It was a Top 10 name between 1936 and 1992, even ranking at #1 in 1960. It currently ranks at #18 in 2014. This name really spans all ages as a first name, and seems to be common as a middle name too. (10 uses) Thomas is the Greek form of the Aramaic name Ta'oma meaning "twin". This is a biblical name that was introduced to England by the Normans and grew in popularity. There were a couple saints and philosophers with this name, and also a president and an inventor. A good, traditional name that works as a first name or a middle name nicely. This name has always been popular, consistently ranking within the Top 15 from the 1880s through the 1960s. After that, it dropped a bit but still remains within the Top 70; it was #54 in 2014. (9 uses) Anthony is the English form of Antonius which is a Roman family name. Its meaning, though, is not certain. It has been incorrectly associated with the Greek anthos, meaning flower, which added an h to the name which was originally not there. A famous bearer was Mark Antony, (or Marcus Antonius) who ruled the Roman Empire with Augustus. He wound up with a tragic story along with his mistress Cleopatra; their story was later told by Shakespeare in 1606's "Antony and Cleopatra". As a name in the US, Anthony is much more common than Antony. It has almost always ranked within the Top 100, peaking at #7 in 2007. It's currently ranked at #21 as of 2014. (9 uses) Daniel means "God is my judge" as derived from the Hebrew name Daniyyel. A biblical prophet wore this name which upped the popularity in England through the Middle Ages. It grew rare again after that until it was revived after the Protestant Reformation. Other noteable bearers include authors, mathematicians and frontiersmen. This is is another traditional, biblical name that has never ranked lower than #55. It has ranked as high as #5 in a number of years; and currently is #10 in 2014. (9 uses) Scott comes from an English surname but it originally referred to someone from Scotland or someone who speaks Scottish Gaelic. Its root is the Latin Scoti which literally means "Gaelic speaker". Even though this name still ranked at a respectable #425 in 2014, you're probably more likely to find this name on someone born between 1960 and 1975. It was very popular during that time, ranking as high as #10 in 1971. Today, you may encounter it more often as a middle name. (8 uses) Allen is a variant of Alan, but both names have a few different etymologies. The name was first introduced to England by the Bretons in the 11th century. Possible meanings include "deer" in Breton and Welsh, "little rock" in Irish, or "beautiful/handsome" in Irish and Scottish Gaelic. Another possibility is that it's English and French via the Indo-Iranian name alans. So the meaning is unknown, but most layman baby name sites list it as "handsome". In the US, Allen started out as the more popular choice, then they both ranked together in the Top 100 from the late 1930s to the late 1960s. Then Alan became the more common choice. Today, as of 2014, Alan ranks at #170 and Allen ranks at #367. Which do you prefer? (8 uses) Andrew is the English form of the Greek Andreas, which itself came from andreios meaning "manly" or "masculine", a derivative of aner which means "man." It is theorized that the biblical Andrew was called that as a nickname for or a translation of his real Hebrew name, but that name is unknown. Andrew was popular in the Middle Ages with Christians. Saint Andrew wore the name, along with 3 Hungarian Kings and an American President. In the US, Andrew has always ranked within the Top 90. It spent time in the Top 10 many times since 1986 and currently ranks at #22. (8 uses) Derived from Christophoros and Christos to mean "bearing Christ", the Greek name Christopher was popularly used to indicate that the bearer literally carried Christ in their hearts. As an English name, it has been used since the 15th century. There are a few different translations of this name, such as Christoffer which was used on 3 Danish Kings. Famous bearers include explorers and playwrights. In the US, the name has always been well-used, ranking in the Top 10 from 1967 to 2003. As of 2014, it's #30. 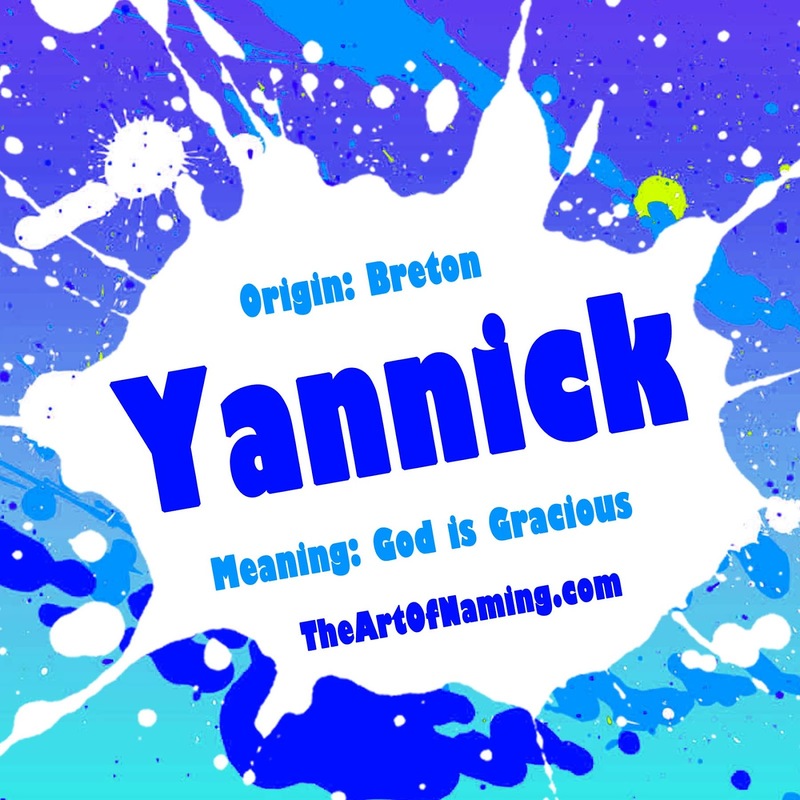 (8 uses) Matthew comes from the Greek Matthaios which came from the Hebrew name Mattityahu meaning "gift of YAHWEH". Saint Matthew was also called Levi and was one of the twelve apostles who also penned a Gospel book. The English used this name since the Middle Ages. Here in the US, Matthew has ranked within the Top 100 since 1956, peaking at #2 in 1995-1996. Today it is the 16th most popular name in the US as of 2014. (8 uses) William comes from the Germanic name Willahelm which is composed of the elements wil "will, desire" and helm meaning "helmet, protection". This name was brought to England by the Normans and remained very popular through the Middle Ages until now. The most famous William of today is England's Prince. Before him, the name was worn by kings and conquerors. It has also been the name of many writers and poets. In the US, William ranked within the Top 10 for nearly a century. It descended to #20 in the 1980s and 1990s, but currently climbed back up to #5 in 2014. (8 uses) Edward is composed of the Old English elements ead meaning "wealth" and weard meaning "guard" which makes the meaning "wealthy guard". Edward is a regal name with use in England. This name has international spellings such as Eduardo, Eduard, Edvard, Ekewaka, Duarte and Edorta. This name ranked within the Top 100 from 1880-1996. Despite Twilight, the popularity of the name Edward wasn't really affected. In 2014, it ranked at #160. (7 uses) A German name made from the elements ric meaning "power, rule" and hard meaning "brave, hardy" which makes Richard means "brave power". The Normans brought this name to Britain and it has always been common there. It was even used by 3 kings. It was most popular in the US in the 1940s and 1950s. Richard always ranked in the Top 100 up until 2006. As of 2014, it is now at its lowest rank of #141. (7 uses) Charles is said to come from the German name Karl which means "man", however it is also possible that it came from the German hari meaning "army, warrior". And yet, layman baby name sites like to list it as meaning "free man". Take your pick, I suppose. This name was popular in Europe during the time of Charles the Great, or Charlemagne (742-814). Beyond him, there have been many Kings of France, Spain, Portugal, Sweden, Hungary and England by the name. Even some Holy Roman Emperors. Add in Darwin, Dickens and others, this name has been well used. In the US, it has always ranked within the Top 70. There were over 40k boys named Charles in both 1947 and 1949. These days, you'll only find about 7k boys per year. It ranked #51 in 2014. (6 uses) Paul comes from the Roman family name Paulus meaning "small" or "humble" in Latin. This was the name of an important Christian figure, Saint Paul, whose Hebrew name was originally Saul. There have been many other St. Pauls along with six popes by the name, too. This name was not common during the Middle Ages; it took until the 17th century for the name to catch on. This name translates very well across the languages such as Paolo, Pavel, Pól, Pasha, Pablo, Paulos and others. Here in the US, Paul ranked within the Top 100 until the year 2000. It had the most usage per year through the 1950s and 1960s, but recently, the name has fallen to the rank of #201 in the US in 2014. Perhaps it has more usage now as a middle name to honor all those grandpas born in the 50s and 60s. Other middle names that appeared frequently within The Art of Naming's birth announcements but didn't make the cut for this list include Lucas, Arthur, Patrick, Robert, Lewis/Louis, Steven/Stephen, Timothy, Wayne, Samuel, Ryan, Frederick, Lawrence, Ray and Wesley. 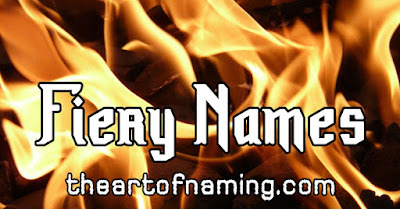 Beyond these 35 names mentioned above, anything else that you choose for a middle name will probably not be quite as commonly used, however, since this data is very limited, there are surely names more or less popular in specific locations. Other middle names that could be added in as "modestly popular" may include Vincent, Xavier, Gabriel, Dean, Benjamin, Oliver, Cole, Everett, Grant, Isaac, Jacob, Isaiah, Nathaniel, Reid, Russell, and Vaughn. There's bound to be a lot of discrepancies between this data and what you may experience in your particular area, so this list is meant as a basic guide to which names are most likely popular for middle names if that is something you're trying to avoid. So I ask, which middle names do you hear most often for boys in your area? 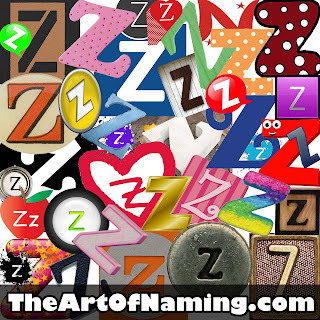 Our final featured name for this alphabetical name series is the female name Zoey. Did you get a chance to view the final list of The Very Best Z Names for Boys and Girls earlier this week? 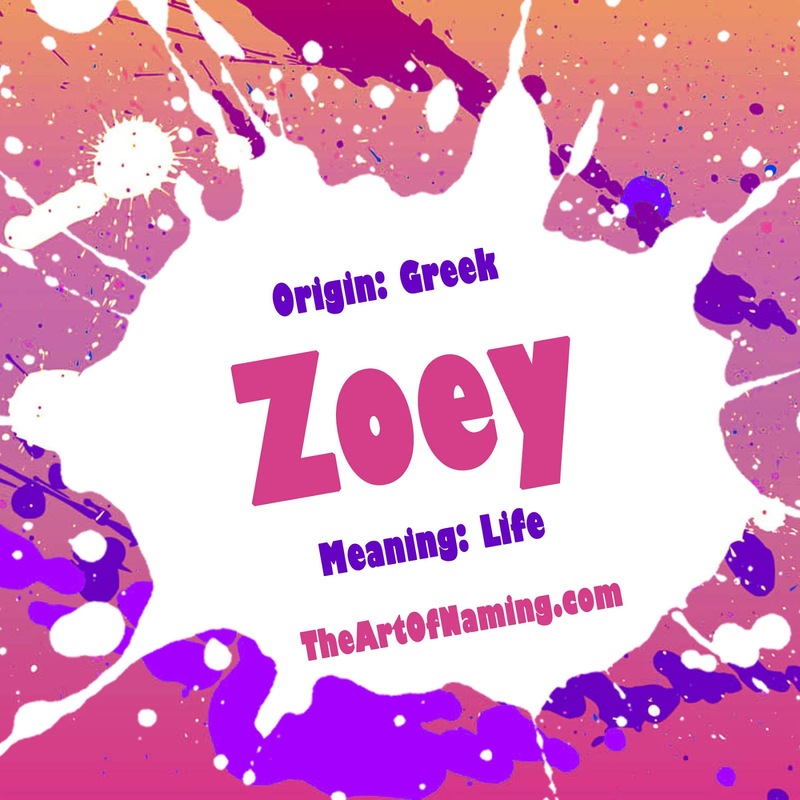 The name Zoey is actually a variant of Zoe. Interestingly, while Zoe has been in use in the US since before 1880, Zoey has only been around since 1967. Despite that, Zoey is the more popular spelling today. Both names are currently ranking within the Top 40 though. Zoey joined the Top 1000 chart in 1995 and entered the Top 100 in 2008. 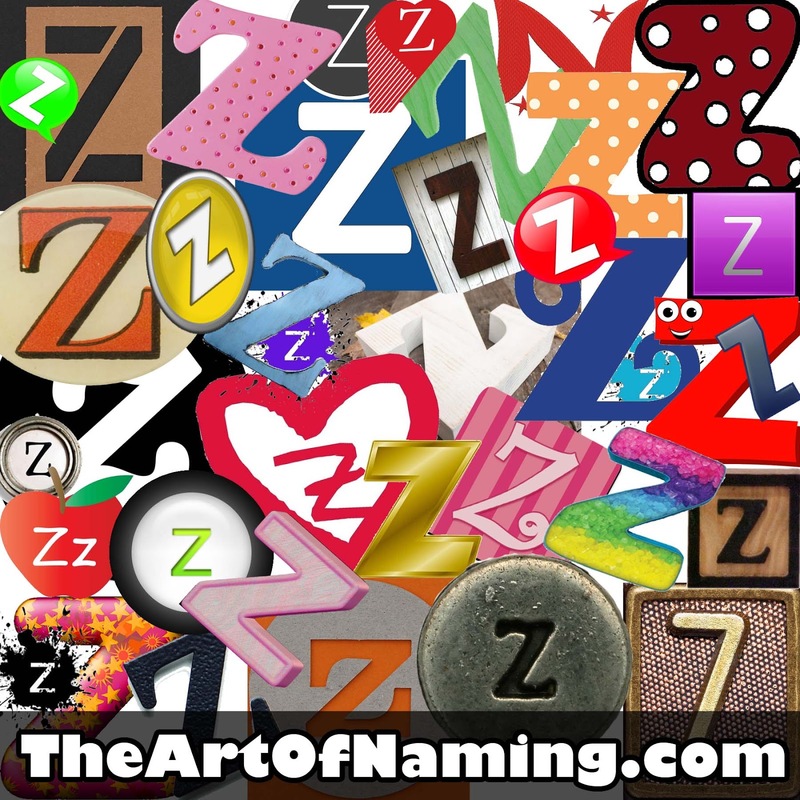 Now, as of 2014, Zoey is the 22nd most popular name in the country with over 7,300 female births. Zoe peaked quicker, entering the Top 1000 in 1983. By 2000, Zoe was the 82nd most popular girl name. Even though Zoey has surpassed Zoe, Zoe still ranks at #32 in 2014 with over 5,800 births. After breaking down those American popularity statistics, which name do you prefer? If you're not sure, let's take a closer look at the names. Zoe is a Greek name that means "life". According to Behind the Name, Zoe was historically considered a translation of the name Eve by Hellenized Jews. There are two early Christian saints named Zoe, both were martyred in their day. In the Byzantine Empire, Zoe was actually a commonly used name for women including an empress in the 11th century. There are plenty of variations of Zoe, including the one we are featuring today, Zoey. There's also Zoie and Zowie. The Dutch like the spelling Zoë, the French use Zoé, the Polish go with Zoja, while Russians and Ukrainians prefer Zoya. Then of course there's the spelling Zooey which is popularized in Hollywood by actress/singer Zooey Deschanel. While she pronounces her name the same as Zoey or Zoe, the name Zooey is better known as a masculine nickname for Zachary or Zechariah. Author J.D. Salinger used the name Zooey for a male character in his book "Franny and Zooey". Deschanel was named after that character. Believe it or not, the name Zoe has broad international appeal. In recent years, it has ranked within the Top 100 in at least 17 countries around the world including The Netherlands (#7), Hungary (#9), and France (#11). Click here to view a complete list of recent popularity rankings. Thanks for following this series for the past year! Tell me in the comments which name you prefer and what middle name you'd pair with it! Aria, Gale & Zephyr: These Windy, Airy Names Will Blow You Away! At this point, The Art of Naming has covered Water Names, Rocky Names and Fire Names. Let's take a look at some names that are inspired by wind and air. 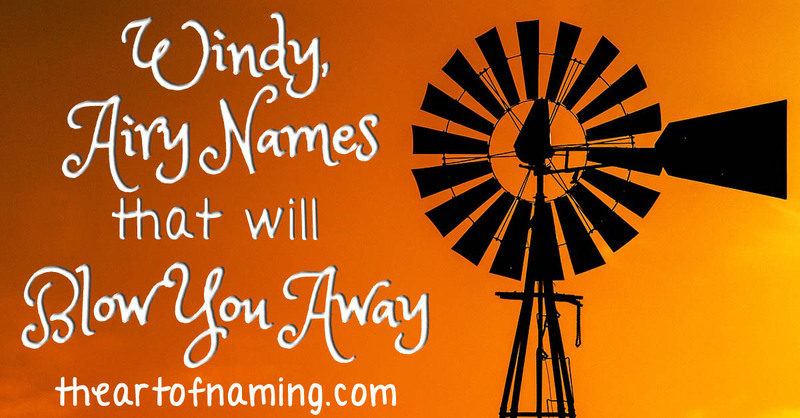 Airy names can be quite refreshing like a gentle breeze, or much more powerful and interesting like the strong winds of a tornado or hurricane. Most of the names on this list are uncommonly used for modern children today, except for Aria which is climbing the charts for girls. Take a moment to browse through these names. Which are your favorites? Can you think of any others that could be added? The name Anil is a masculine Sanskrit name meaning "air, wind". It has ranked in the US since 1959 but never received more than 45 births in a single year which happened in 1989. As of 2014, there were only 5 boys named Anil. Perhaps this decline in usage indicates that it is not currently fashionable within its culture. What do you think of it? In Italian, this name literally means "air". Most will also know, though, that it refers to a song or a melody, both of which are sometimes listed as the name's meaning. An aria is an elaborate vocal solo in an opera. As a name, it has been in use since 1900 in the US but it was not at all common until recently. It joined the Top 1000 chart in the year 2000 and then made it into the Top 100 by 2012. Most recently, Aria has ranked as the 31st most popular name with nearly 6k births in 2014. Aura is an English word most typically defined as "the distinctive atmosphere or quality that seems to surround and be generated by a person, thing, or place," according to Google. But as a name, it is said to be derived from Greek via Latin with the meaning of "breeze", according to Behind the Name. This is a rare name and has not ranked within the Top 1000 in this modern age of naming, but it has been used on record since way back in 1881 in the US. It technically ranked a few times in those early years but it hit #641 with only 16 births in 1888 which is very unlike today's popularity stats. Today, 85 births in the year 2014 gives Aura the popularity ranking of #2201. This is a beautiful Welsh, Cornish and Breton word that means "(poetic) inspiration". You may be wondering where the "air" theme comes into play. Awen is a very flowy name. Awen is said to be a flowing spirit, and that spirit is the essence of life. The airy part, though, comes from the word itself. Its Indo-European root "-uel" means "to blow" and has the same root as the Welsh word awel which means "breeze". This breezy, whimsical name is truly unique in the US since this name has never been given to at least 5 girls in a single year. It is, however, sometimes ascribed to poets and musicians. A gale is defined as "a very strong wind". As a name, Gale can either be derived from the Middle English gaile which means "jovial" which is considered a masculine name. It could be a variant short form of Abigail, which would be feminine. The same applies to the spelling Gayle, but this name could be used for either gender. Gale peaked in popularity for females in 1957 at #245 with a total of 1,208 births for the year. After that, the name declined and is not in constant use today. It nearly died out altogether in the 1990s and 2000s, but there were a few births such as 6 in 2011 and 6 in 2013. For males, it peaked in 1947 with 377 births and a rank of #352. Currently, it's also fading away but there were 9 births in 2014. It goes without saying that this name isn't currently fashionable for either gender. Do you think it could come back in style? We have all heard this Hawaiian name on its most famous bearer, actor Keanu Reeves. Since this is an unusual name, he will probably continue to be the biggest associaton with the name for some time. This name can actually be given to either males or females. It means "the cool breeze" from the Hawaiian ke, a definite article, and anu meaning "coolness". Mr. Reeves may be the reason this name gained usage in the US. It wasn't given to children at all until 1990 for boys and 1991 for girls, right around the time the actor began becoming more well-known in Hollywood. Usage ceased for girls in 2006, but it is still being used for a good amount of boys each year. In 1990, there were 8 male births, by 1992, there were 105, and the name joined the Top 1000 chart by 1994 with a rank of #755. Today, in 2014, there were 141 boys named Keanu for a rank of #1259. Nasim is a unisex Arabic name that means "breeze". It does have some spelling variations such as Naseem and Nassim in Arabic, Naseem in Urdu, and Nesim in Turkish. Pakistanis use this name. Here in the US, both Nasim and Naseem were originally given more often to girls from the mid-1970s to the early 2000s, but usage has nearly stopped. For boys, Nasim and Naseem gained usage in the 1990s and managed to keep it consistently since then. There were 5 boys named Nasim (and 5 girls too) in 2014. There were 22 boys named Naseem (but zero girls) in the same year. Which of these two spellings do you like more? Shu might not be a name that is on the radar for American parents, but it is interesting to note. Shu is the name of an Egyptian god. He is known as a personification of air, or the "God of the wind and air." He is also associated with sun and light. Shu means "emptiness" and "he who rises up" in Egyptian. Interestingly, the name Shu does have a sprinkling of usage over the years for both genders. On record, there's been a total of 12 females named Shu (births in 1978, 1983 and 2007). For boys, there has never been more than 8 births in a single year, starting on record in 1992 for a total of 52 recorded male births. There could be even more people named Shu out there but we will never know about them since the SSA doesn't record fewer than 5 births. If there were only 3, they wouldn't be on the list. What do you think of Shu? If you're looking for a ton of wide open air, where else would you look but up? The Earth's sky looks blue during the day because air scatters blue sunlight more than it scatters red. While Skye and Sky aren't directly associated with wind, the sky is massive and full of air. Originally in the US, Sky was given to males and Skye was given to females starting in the mid-1950s. Since 1970, both names now have moderate usage for both genders. As of 2014, Sky is ranked at #740 for girls and #1402 for boys. Skye is the most popular spelling overall with a ranking of #368 for girls. For boys, Skye is down at #2258. These stats suggest that while it is a unisex name, it is more commonly given to females. Which spelling do you prefer and for which gender? A storm is defined as "a violent disturbance of the atmosphere with strong winds and usually rain, thunder, lightning, or snow." We're all familiar with storms. We've surely all been caught in one before. Wind storms can vary depending on the wind speeds, but the faster they are, the more destructive. They could escalate into dust storms, blizzards, tornadoes or hurricanes. The names Storm and Stormy have been used for both genders since the mid-1940s. The one with the most use is Stormy for a girl. As of 2014, Stormy was given to 104 girls and only 6 boys. Storm was given to 58 girls and 61 boys. Stormie is also given to girls; there were 69 born in 2014. Which spelling do you prefer? Which gender? 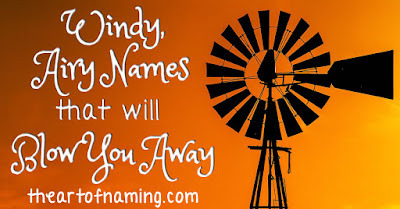 Windy has been used as a name in the US since 1948 for females. It even ranked in the Top 1000 from 1967 to 1980. Alternate spelling Wendy was much more popular during the same time period, ranking as high as #28 in 1970. However, Windy is more of a nature name inspired by actual wind which is defined as "bulk movement of air". Wendy is typically a shortened form of the Welsh name Gwendolen and other similar names. So Windy and Wendy aren't actually related. Which do you like more? Zephyros was the Greek god of the west wind, so the name Zephyr also means "the west wind". This name is typically masculine since it is the name of a male god, but in the US, it was originally given to females way back starting in 1905 to 1937. Nobody received this name on record after that until it popped up for boys in 1975, and again for girls in 1981. These days, there were 99 boys and 21 girls named Zephyr in 2014. According to Wiki, "the practice of using names to identify tropical cyclones goes back many years, with systems named after places or things they hit before the formal start of naming. The system currently used provides positive identification of severe weather systems in a brief form, that is readily understood and recognized by the public." The first person to begin naming storms was a meteorologist named Clement Wragge. He named systems between 1887 and 1907, but after that, the practice fell into disuse until World War II. There are many more lists like these that you can browse through if you'd like! What do you think of all the above names? Are there any more air or wind related names that could be added?